Scientists have revealed details of the means of operation of the so-called 'fat gene' and its interrelationships with other proteins within the DNA chain. The identification of the gene, known by its genetic identifiers as LRDY, is seen as a breakthrough for millions of sufferers whose bodies are unable to naturally regulate their pie intake. "The benefits of this large body of research into people's susceptibility to LRDY are numerous. We hope to be able to offer a genetic therapy which can be administered by injection, or orally in say a chocolate milkshake," said the leader of the research team, Professor J. Scott Billingsworth. "Not only that but during the research we collected enough free burger tokens to keep the population of Glasgow fed for at least 10 minutes. We have about a billion tokens." 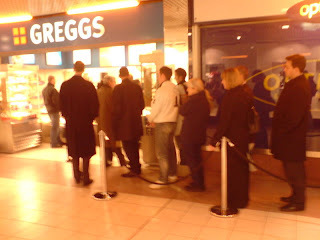 The researchers say that those desperate for a reason to cancel their gym membership should check for symptoms which include a compulsion to queue outside a Gregg's Pasty shop and spasms of the nervous system around a salad bar. A group of very large campaigners welcomed the news from the research team and said that it made an even more compelling case for cream cakes to be made available on the NHS. "It is such a relief that it is an evolutionary trait dating back hundreds of thousands of years that compels me to drive the few miles to my nearest pub and order six packets of pork scratchings. Three times a day," panted Michaela Billingsworth of the 'Fat and Fit' campaign from the steps of 10 Downing Street. "Oh Jesus, I need a sit down. And a mars bar." The research team however revealed that there was a statistical link between sufferers of excess LRDY production and the millions of people who suffer from the mental condition known as being 'big boned'. "Despite the historic discovery made last year, it is clear that being big-boned is a mental disorder," said Professor Billingsworth. "The statistics show that 93% of 'big boned’ sufferers answered positively to the research question 'Would you like fries with that?'" The LRDY gene exists to a greater or lesser degree in all of us, said the research team, however other proteins in the DNA chain regulate it. "What is clear is that a person's susceptibility to LRDY is directly related to the production of the protein responsible for the American accent," said Billingsworth.